A $500 million event that happens once a year watched by 111.3 million people, supported by some of the world’s biggest sponsors, is put on hold for 30 minutes by a power outage. When this kind of failure can happen at the Super Bowl it’s not surprising that those who run and support events are kept awake at night worrying about what can go wrong – you only get one chance to get it right. 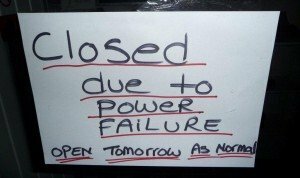 Power outages can happen to the biggest and best events, no matter what the location and with just about everything relying on power to some degree it’s important to look at how to mitigate any issues if the lights do go out. The first step is to identify what power you have and the risks associated with it (it’s very easy to take for granted especially when in a permanent building), closely followed by identifying what services rely on it. From a technology point of view this list can be very long – access control, internet, telephony, two-way radio boosters, ticket systems, CCTV, Wi-Fi to name a few. Each service should be reviewed for impact and with this information decisions made on whether to employ mechanisms to minimise risk. It’s also important to understand the interdependencies, for example a decision may be made to have a back-up generator for Event Control but if the phones and radio communication cease to function due to power loss elsewhere on site then the operation could still be impacted. These days box offices and entrances struggle to operate without power as they rely on real-time ticket scanning and electronic payment. In these key areas it’s important to not only have a power backup plan but also a contingency plan to continue operating if the power plan fails – even if that involves manual checks over the radios or using runners. Many events now rely on a network for many of their systems – from ticketing & phones through to CCTV. That network needs to be designed with redundancy and power failure in mind. All key points should be protected by a monitored UPS (Uninterruptible Power Supply) – the monitoring is important so that central control knows if power fails how long the battery within the UPS can continue to operate for, especially as it can take some time for a power issue to be diagnosed and rectified on a large site. For critical areas, such as servers and core networking, the UPS needs to have a significant operational time which may involve the ability to ‘hot swap’ batteries to extend run-time indefinitely. Modern VoIP telephones, CCTV cameras and other network equipment can be operated using PoE (Power Over Ethernet) which means they take their power from the network itself rather than a mains supply. The benefit of this is that the power required can be centralised and protected with a UPS so that the impact of local power outages in cabins and offices can be minimised. Events will always have to deal with the unexpected happening – it’s part of the excitement and challenge of the live industry but sensible planning and preparation can minimise the impact.